The Maxpedition Jumbo Versipack is an enlarged version of the Fatboy, with a main compartment that is 38 percent larger to store even more equipment. 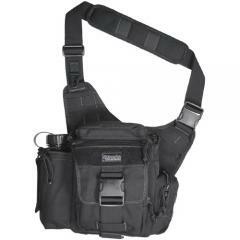 Its quick-release padded shoulder sling can be adjusted to place it at the perfect position for quick access, making it comfortable and convenient to carry. The durable 1000 denier ballistic nylon fabric resists wear effectively, and comes with a triple polyurethane coating, taped internal seams and a storm collar to keep water out. Its multiple external and internal pockets make it easy to keep your gear organized and accessible, and it includes a water bottle holder for a bottle up to 32 ounces as well as an internal Keyper key organizer. The rear external slip compartment contains a loop field sized for a concealed carry holster for covert weapon storage.